One of the best ways to protect a dock, wall or keep a hole in the ice for a pump intake or a honey hole open for hunting is an Ice Eater. These inexpensive agitator bubblers involve placing a heavy-duty submersible motor that drives a rugged propeller in continuous duty to draw warm waters from the depths of the pond or lake towards the surface. The warmer waters at the bottom of the pond or lake typically maintain a temperature of around 4 degrees Celsius and by bringing these waters rapidly to the surface in a directed thrusting stream they can keep large areas of open water even in the coldest of winter temperatures. The thrust of these deicers also assist with maintaining open waters and in total the diamter of the hole will be from 5' to 10' in diameter per foot of submergence of the Ice Eater depending on the horse power of the unit. 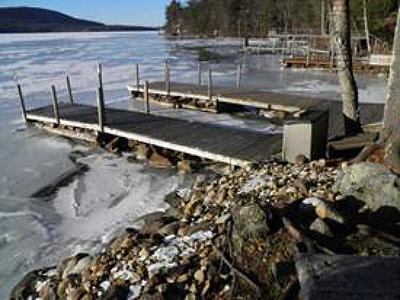 This sort of deicer works best when depth is greater than 5 feet but even an agitator aimed at the shallow shoreline, if it originates in waters of say 12 feet deep, can create a large opening under the entire dock structure. The size of the opening in the ice depends on the overall ambient air temperature, horse power and angle of the Ice Eater. Another even cheaper technique is to hang a pond pump off the dock and ensure the outlet is aiming towards the surface. A strong enough pump will keep a nice hole open. Sump pumps are not designed for continuous duty so a pond pump is better. Kasco Marine, Inc. offers several sizes, models, and mounting options of De-Icers to accommodate almost every application and condition. Atlantic Pond Supply offers Free Shipping in Canada. With sizes of 1/2, 3/4, and 1hp and units available in 110/120V or optional 230/240V is available..
Ice Eater® Dock Bubbler Deicer by Powerhouse Inc. are the most energy efficient submersed thrust deicers and the industry standard in preventing dock damage in Canada. Ice Eater® deicers are designed to be used in the harsh Canadian climate and are used in Ontario, Nova Scotia, Quebec, New B..
Ice Eater® replacement parts. Propeller for 1/4 HP Ice Eater (P250) Propeller for 1/2 HP (P500), 3/4 HP (P750), and 1 HP (P1000) Zinc annode - Sacrificial, 1/2" interior diameter, fits all Ice Eater models. .. Replacement props and zinc annodes for Kasco deicers are available to maintain your deicer and ensure a long lifespan. Dock mount kits and horizontal float units can also be used to support your deicers depending on the application or surroundings. C-10 Thermostat Controller The C-10 uses ..